Instead of social media with friends, I'm now pursuing business contacts. The netiquette is clearly different. How can I make the best impression on professional people? Asking this question shows you're already aware of the new expectations for behavior in the workplace. That is first rule of netiquette, being aware of the person on the other end of the computer. Dale Carnegie said, “We are evaluated and classified by these four contacts: what we do, how we look, what we say, and how we say it”. This still holds true for you online. You need to send the right message online and in your situation, at college looking for future business contacts. It needs to convey professionalism. We'll take a look at email first, since it's the primary method of communication between business professionals. 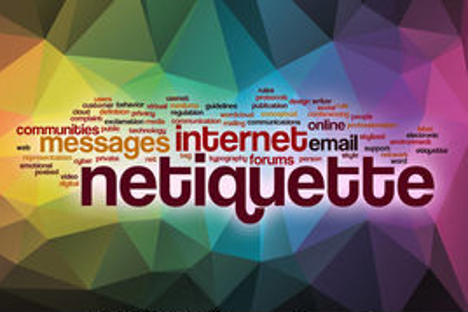 Email etiquette should be in mind every time you're writing to a potential business contact. Complete the subject field as succinctly as possible to enable them to read and file it with ease, as it will also determine whether your email is even opened or not. Don't start the message with ‘hi’ or ‘hey’, use formal terms as you would in a letter if you don't know the recipient. Referencing as Mr/Ms, or Dear Sir/Madam is advised if you're not already familiar with them, and start every email with a blank page, don't just hit reply from older messages. A good tip is to compose emails in a word processor program first to ensure spelling and grammar is correct, then paste it into the email message field and proof read it before sending. Make use of the signature in your email client, adding your full name, website, and any professional social media profiles you have. A company email address or one at your own domain name looks far more professional than using a ‘freemail’ account such as Hotmail or Yahoo, advises Ocean SEO. Use the cc and bcc fields only when there are other associates included in the discussion and avoid the ‘reply to all’ function; business people do not appreciate getting flooded with emails not destined for them. Don't send huge attachments unless requested, linking to an online resume would be far more efficient. A prompt response is always appreciated by those with busy working lives, reply to emails as soon as you can. Most potential employers now will look for the social media profiles of applicants before arranging interviews. Make sure you keep your personal and professional profiles separate and use the privacy functions to hide anything you would not want business contacts to see. Check the profiles of others before reaching out, social media is infested with spammers and hackers so only focus on real professional people and profiles with photos. Join online groups with an interest in your chosen field to get to know the players. You may get some contacts there. Instant messaging is rarely used for first time contacts, but if you're in a dialogue with it, keep messages simple and avoid using emoticons or web dialogue. Keep messages short and stick to email for anything confidential or important. Remember: use a professional profile name, it's usually a good idea to have more than one account, and keep business and pleasure separate when online. Tweet others the way you want to be tweeted - G. Kent.